Weasel is the common name for various carnivorous mammals in the genus Mustela of the Mustelidae family, typically characterized by a long, slim body, long neck, short legs, rounded ears, and medium to long tails. The genus also includes minks, ferrets, and ermine, which also may be known collectively as weasels. The term weasels also is used more generally for all members of the Mustelidae family, the "weasel family," which includes martens, badgers, and otters. Originally, the name "weasel" was applied to one species of the genus, the European form of the least weasel (Mustela nivalis). Early literary references to weasels, such as their common appearances in fables, refer to this species rather than to the genus as a whole, reflecting what is still the common usage in Britain. In technical discourse, however, as in American usage, the term "weasel" can refer to any member of the genus, or to the genus as a whole. Of the 16 extant species currently classified in the genus Mustela, ten have "weasel" in their common name. Among those that do not are the stoat or ermine, the two species of mink, and the polecats or ferrets. While the word "weasel" in English often has negative connotations of someone who is devious or treacherous, and these carnivores have earned a bad reputation as consumers of poultry, weasels provide many values for ecosystems and humans. Ecologically, they are vital components in many terrestrial and aquatic food chains, consuming rodents, fish, frogs, and eggs, and being consumed by foxes, coyotes, and predatory birds (hawks and owls). They help greatly in the reduction of rodent populations, including mice, rats, squirrels, shrews, and rabbits, even chasing them into their burrows—a benefit that likely exceeds their detriment to poultry farmers. For humans, they have been a source of valuable fur and add to the human wonder of nature. Beyond the "true weasels" comprising Mustela, the name weasel also is used for various species in other genera in Mustelidae, notably the Patagonian weasel (Lyncodon patagonicus), the Libyan striped weasel (Poecilictus libyca), and the white-naped weasel (Poecilogale albinucha). Weasels are member of the mammalian order Carnivora, which includes such familiar groups as dogs, cats, bears, and seals. There are over 260 species in Carnivora, which are divided into two main sub-orders: Feliformia (cat-like) and Caniformia (dog-like). The weasel family, Mustelidae, belongs to the subgroup Caniformia, which includes such major sub-groups as the families Canidae (dogs, wolves, and foxes), Ursidae (bears), and Mephitidae (skunks), as well as the pinnipeds (seals, sea lions, and walruses). The Mustelidae family includes 55 species of weasels, badgers, and otters, among other similar mammals, placed in 24 genera. This "weasel family" is a diverse family and the largest in the order Carnivora, at least partly because it has in the past been a catch-all category for many early or poorly differentiated taxa. Mustelids (members of the Mustelidae family) vary greatly in size and behavior. The least weasel is not much larger than a mouse. The giant otter can weigh up to 76 lb (34 kg). The wolverine can crush bones as thick as the femur of a moose to get at the marrow, and has been seen attempting to drive bears from kills. The sea otter uses rocks to break open shellfish to eat. The marten is largely arboreal, while the badger digs extensive networks of tunnels, called setts. Within a large range of variation, the mustelids exhibit some common characteristics. They are typically small animals with short legs, short round ears, and thick fur. "True weasels" comprise the genus Mustela. They are found in Europe, Asia, the Americas (North and South), and Africa. The "common weasel" M. nivalis, is found widely distributed in Europe, Asia, and North Africa and is now being considered the same species as the small "least weasel" of North America, which formerly had been classified as a separate species, Mustela rixosa. 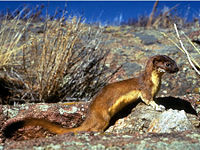 The larger "long-tailed weasel" (Mustela frenata) is the most widely distributed mustelid in the New World. Its range extends from southern Canada through most of the United States to Mexico, Central America, and the northern parts of South America. Mustela erminea is known as the "stoat" in Europe and as the "short-tailed weasel" and the "ermine" in North America. It can be found almost everywhere throughout the northern temperate, subarctic, and Arctic regions, that is in Europe, Asia, Canada, and the United States. It also introduced into New Zealand. Weasels vary in length from 15 to 35 centimeters (6 to 14 inches), and usually have a light brown upper coat, white belly, and black fur at the tip of the tail. In many species, populations living at high latitudes molt to a white coat with black fur at the tip of the tail in winter. They have long slender bodies, which enable them to follow their prey into burrows. Their tails are typically almost as long as the rest of their bodies and can be anywhere from 22-33 cm long. As is common with small carnivores, weasels have a reputation for cleverness and guile. Weasels feed on small mammals, and in former times were considered vermin since some species took poultry from farms, or rabbits from commercial warrens. Certain species of weasel and ferrets, have been reported to perform the mesmerizing weasel war dance, after fighting other creatures, or acquiring food from competing creatures. In folklore at least, this dance is particularly associated with the stoat. Collective nouns for a group of weasels include boogle, gang, pack, and confusion (Bertrand 2007). Some members of the Mustela genus have exquisite furs that have been valuable for many centuries. In particular, the mink, the sable (a type of marten), and the ermine (stoat) have been iimportant in the fur trade and have been raised for their fur. The ferret has been domesticated and kept as a pet. The following information is according to the Integrated Taxonomic Information System, and IUCN 2006 for the extinct Mutela macrodon. 1 Europe & Northern Asia division excludes China. In English-language popular culture, the term "weasel" commonly is associated with devious or treacherous characters. Many of these references tend to treat weasels as a species rather than a genus; for example, in Brian Jacques' Redwall series, weasels are one of many villainous races, along with rats and ferrets—although ferrets, biologically speaking, are a species of weasel. In reference to the weasel's reputation for skullduggery, the phrase "weasel words" means insincere or devious speech. Elements of the U.S. media described the declaration by France, Germany, and Belgium against the 2003 planned overthrow of Saddam Hussein's Iraq government as "The Axis Of Weasel," a pun on the "Axis of Evil." A popular cynical office poster states, "Eagles may soar, but weasels don't get sucked into jet engines," meaning that office workers who stay low and act in their own self-interest may be less likely to rise in the organization but are also less likely to be destroyed as a result of office politics. British popular-culture references to weasels are generally specifically to the common or least weasel. For example, Alan Lloyd's novel Kine, about a fictional war in the English countryside between weasels and the invasive species mink, depicts the latter as sadistic, voracious invaders, giants in comparison to the weasels; in American usage, both species would be kinds of weasel. Similarly, in Kenneth Grahame's popular story The Wind in the Willows the villains are the weasels and the stoats, again two species of weasel in American usage. Here everyday usage reflects the original European use of the word weasel for a single species. A kamaitachi is, according to Japanese myth, a malevolent, weasel-like wind spirit, wielding a sharp sickle. They are nearly always depicted in groups of three individuals, and the three act together in their attacks; the first one hits the victim so that he/she falls to the ground, the second slashes with the sickle, and the third partially heals the wound. Also in Japanese mythology, weasels represent bad luck and death. Bertrand, J. 2007. A gulp of cormorants?. The Bosque Watch 14(2). Retrieved on July 24, 2007. Integrated Taxonomic Information System (ITIS). 2007. Mustela. ITIS Report. Retrieved October 11, 2007.
International Union for the Conservation of Nature and Natural Resources (IUCN; World Conservation Union), Mustelid, Viverrid & Procyonid Specialist Group. 2002. Mustela macrodon. 2006 IUCN Red List of Threatened Species. Retrieved on July 24, 2007. Nowak, R. M., and E. P. Walker. 2005. Walker's Carnivores of the World. Baltimore: Johns Hopkins University Press. ISBN 0801880335. This page was last modified on 24 October 2008, at 19:29.